Supermodel extraordinaire who broke barriers and moulds, to define a generation. Decades of walking the most high profile catwalks have solidified her status as a global fashion icon, and one of the worlds first ‘supermodels’. BUT along with the fame came accusations of super-diva behaviour. The queen of sass is never far from the headlines and not always for the right reasons. Check out her most diva moments below! Back in 2007, Naomi was in court to explain herself and why she threw her mobile phone at her maid. 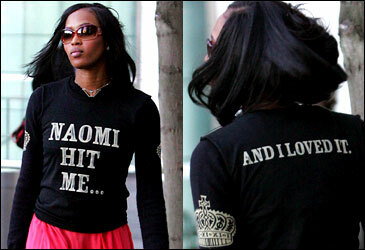 The incident took place in New York with Naomi throwing her mobile in a fit of rage at her apartment. Which apparently was not intended to hit her maid but did anyway – meaning she had to go to the hospital to have stitches. Naomi apologised profusely and made it clear it wasn’t her intention to hurt her – and then undertook anger management. Make sure you have a helmet on if you upset Miss Campbell. A short while later, Naomi was banned from all British Airways flights. After her luggage was lost, the diva had an outburst in First Class (of course) which led to the police being brought on to the flight. In classic Naomi style, she threw her mobile phone at one of the officers. Another mistake, hun? She then proceeded to hit/kick the officers in a furious rage over her bags. In 2000, Naomi pleaded guilty to attacking her PA. And yes, you guessed it. WITH. HER. MOBILE. PHONE. The PA told a courtroom that the model hit her with a phone and threatened to throw her out of a moving car in Toronto two years earlier. Since then a further two members of her former team at least have alleged assault but the cases were dropped. In 2013, Naomi had a minor disagreement with model Coco Rocha. Which led to Naomi telling Coco to ‘check your lipstick before you come and talk to me’. She basically said what we were all thinking. And the most diva version of Naomi is on the runway. This is where she shakes off the past and shows us why she has worked non-stop for decades, opens doors for new models, is making that money and rules the fashion world. Naomi is far more relaxed and rarely makes the headlines as much as she did for her bad behaviour. Letting her talent shine through and working as the independent and in-control woman she is. We LOVE you, Miss Campbell.